Thanjavur also known as Tanjore is a south Indian city that belongs to the state of Tamil Nadu. It is the headquarters of Thanjavur district. Tanjore acquires an area of 14.03 sq mi. Tanjore is located in the Cauvery Delta, at a distance of 314km towards southwest of Chennai and 56kms towards east of Tiruchirapalli. Due to the tributaries of river Cauvery that flows through the city, it has become an important agricultural centre and also known as “Rice bowl of Tamil Nadu”. According to a legend it is believed that the name Thanjavur is derived from Tanjan, a legendary demon in Hindu mythology. The word Thanjavur is a Tamil name. “Than” means “cold”, “chei” means “farmland” and “ur” means “city”; a city surrounded by cold farmlands. Thus the word “Thancheiur” became “Thanjavur” in later days. Thanjavur is an important pilgrim centre and major tourist destination of Tamil Nadu. It is a regional cultural centre that upholds the South Indian art, religion and architecture. UNESCO World Heritage Monuments like Brihadeeswara temple that represents the pride of Chola dynasty, is one of the greatest attractions of this city. Such beautiful town with finest monuments and temples are decorated by fully skilled artisans. As further dug into these temples when the curiosity reaps in, one gets to see the beautiful jewelry boxes, Thanjavur art plates and bowls made of brass and copper. 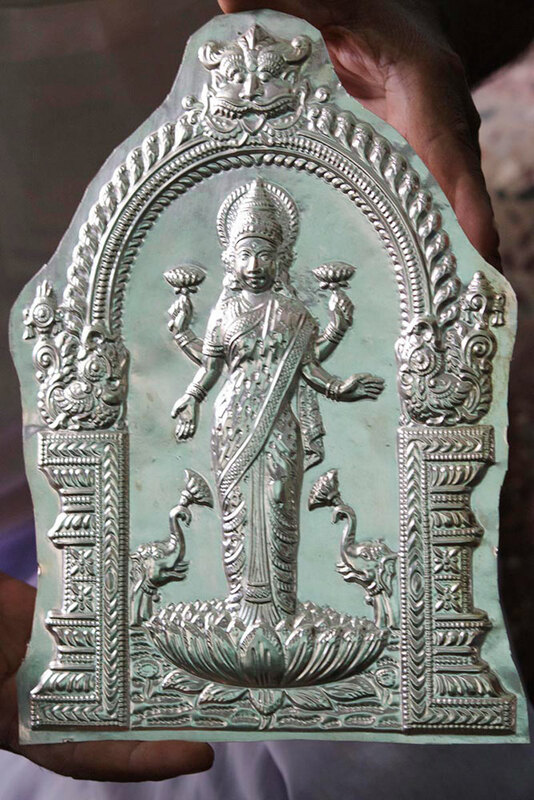 Thanjavur art plate is an artifact that is exclusively made in Thanjavur. These art plates are circular in shape and made as a gift item. 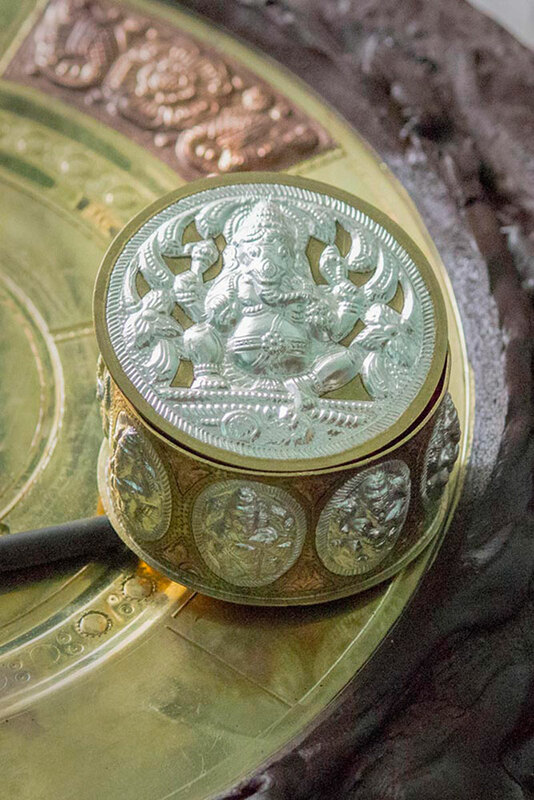 It is a handicraft consisting of metals such as silver, copper and bronze. 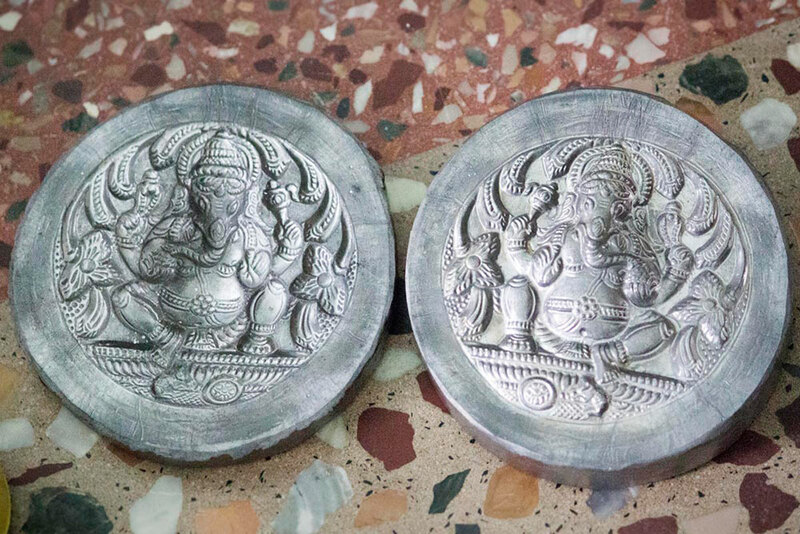 These metals are usually embossed with the figures of gods and goddesses at the centre of the art plate. This unique artwork has been registered for the protection under the Geographical indication of the Trade Related Intellectual Property Rights (TRIPS) agreement. It is listed at item 63 as “Thanjavur Art Plate” of The Geographical Indications of goods (GI) Act 1999 of the Government of India with the registration confirmed by the Controller General of Patents Designs and Trademarks. Hence the metal compositions and particularization have to remain the same while only the size of the article is permitted to be different according to GI approval. The production of Thanjavur art plate dates back to early 18th century. It was introduced by Rajah Serfoji-II (1777- 1832). He was the Maratha ruler of Thanjavur who encouraged the skilled artisans to create magnificent metal artifacts that would reflect the glory of his kingdom's royalty. These metal artifacts were made of brass, silver and copper, which is worth several thousand for each piece of this stunning art. The blend of silver in high relief on the reddish copper ground makes the metal artifacts strikingly beautiful that would last for several millenniums. The final finishing would depend on the artisan’s proficiency and skills. These Thanjavur art plates are crafted exclusively by the Vishwakarma community that consists few of goldsmith families of Thanjavur. It is an inherited profession and it’s the only way of living for them. These artisans with plenty of experience tend to have the sophistication to prepare durable art plates that would retain its glow and shine for a longer period of time. Hence it is declared as a cottage industry whereas it is made in the craftsmen’s houses. Its manufacture is the privilege of the menfolk only. The Thanjavur art plate made in 20th century was displayed at the Government Museum in Thanjavur during 2011. 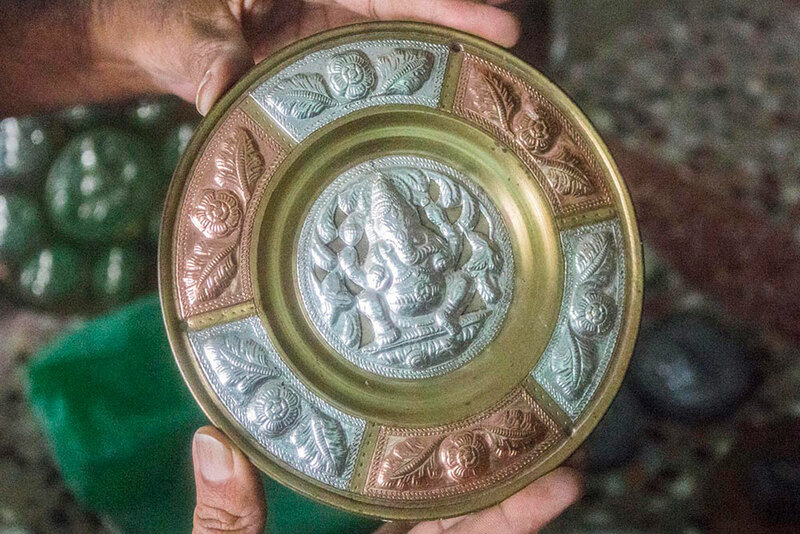 This art plate made of proposed metals had the relief images of lord Nataraja, the sage Pathanjali and the goddess Sivakami in a standing posture over a lotus flower, encrusted at the plate’s central part. 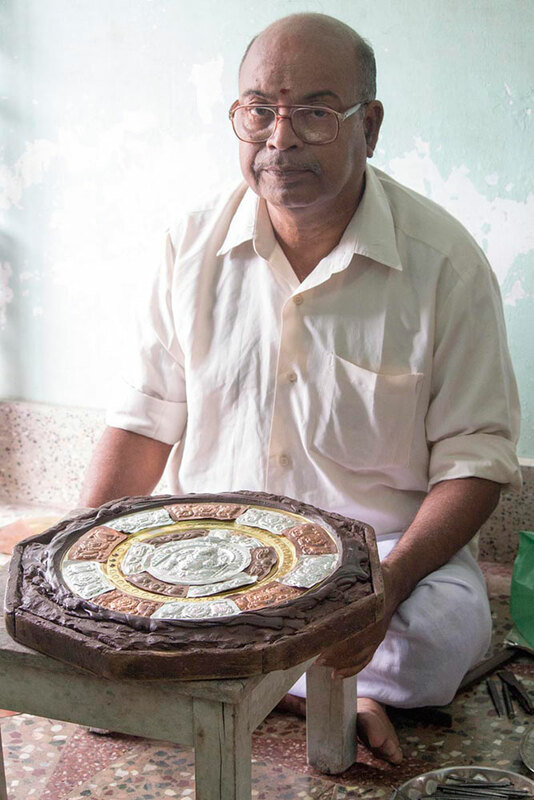 And as per the rules and regulations of modern day legislation, those who wish to initiate the art of making ‘Thanjavur art plates’ should be legally registered and certified producer of this craft. Thus the producer must also possess an authorized user logo that has to be imprinted on all the metal art plates, to ascertain its genuine and authentic description.